Hikes at this time of year can be tricky: Higher elevations are likely still buried in snow. Fallen trees or rocks may block passage. But here’s an easy hike with smashing views of an iconic North Cascades mountain. In early summer, the mountains sometimes just don’t cooperate. Hikes at this time of year can be tricky: Higher elevations are likely still buried in snow, especially after a winter like this last one. Fallen trees or rocks may block passage, or sections of trail may have sloughed off and fallen down hillsides. Access roads are full of potholes big enough to swallow a compact car. But long, beautiful days call us to hike, and so we make our way into the freshly reborn wild. Hoping to avoid inevitable crowds at low-elevation hikes along the Interstate 90 corridor, we recently headed north to explore some of the areas we’d previously skipped between Mount Baker and North Cascades National Park. The mountain itself wasn’t much of an option for a snow-free hike: Mount Baker Ski Area reported a total snowfall of 866 inches by the end of April. The recent weekend we visited, Mount Baker wasn’t even showing any of its glaciated faces, instead shrouding itself in a cloak of thick clouds. Good thing our plan was for a waterfall-focused hike instead. Most of what we wanted to see on the route would be right at our feet. Taking advantage of clear roads around Baker Lake, we headed to its north end, at the end of Baker Lake Road (Forest Service Road 11), for a jaunt along the Baker Lake Trail, which we chose because of its low elevation and recent trip reports indicating that the trail was in good shape except for one bridge at the south end of the 14.5-mile trail. (Washington Trails Association calls it the “East Bank Baker Lake Trail,” if you’re looking for reports.) Since we were doing an out-and-back from the trail’s north end, we didn’t have to decide whether to scramble across Anderson Creek, where the bridge was out. The bridges are one of the most appealing things about this trail, along with occasional great views on a clear day of Mount Baker, a mere 8 miles to the northwest. We crossed the Baker River on a long wood-and-metal suspension bridge, then settled in for a pleasant, undulating hike on which we saw very few other people but lots of plants and birds. At about 2 miles in, at Hidden Creek, crews were finishing up repairs on a carefully constructed and sturdy bridge that still couldn’t withstand a big tree crashing onto it during the winter. From the bridge, we admired the rocky waterfall rushing above and below us via a tight chute. This is a good place to turn around if you’re hiking with kids or want to also hike a way up the Baker River Trail, which leaves from the same trailhead. We continued for a couple more miles, past arrays of flowers and lush undergrowth that seemed to be celebrating summer with every conceivable leaf shape and size. 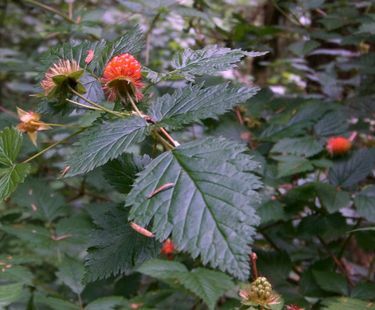 Salmonberries, ranging from flowering to almost ripe, were everywhere, a draw for Rufous hummingbirds. At one point, I heard a “ribbit,” which made me realize how rarely I hear frogs in the Northwest. We saw tiny frogs hopping across the trail here and there. Birdsong accompanied us as we went, and we occasionally saw a flash of gray, brown or yellow through the trees. Giant cedars and Douglas firs towered near the trail. If you don’t get your fill of big trees here, stop off at the half-mile-long Shadow of the Sentinels interpretive trail a few miles to the south on Baker Lake Drive. There, a boardwalk gives up-close access to forest behemoths, some of which are about 700 years old. A few steeper trails near Mount Baker are accessible in early summer. The U.S. Forest Service and volunteer groups such as Citizens for Forest Roads work through the spring to make trails accessible as early as possible. The Forest Service tries to have most roads open by July 1. But even then, be prepared for snow at higher elevations. Goat Mountain: Forest Road 32, off the Mount Baker Highway, is passable, and the trail is clear to the first main lookout point about 4 miles in, which is a fine place to gather astonishing views of Baker, Mount Shuksan and other surrounding peaks before turning around. As of mid-June, the last steep stretch was still snow-covered and best tackled with the proper equipment and experience. Heliotrope Ridge: Glacier Creek Road is open and clear to the trailhead. You’ll encounter fewer gnarly stream crossings if you take the Climbers Trail option — make a right at the junction about 2 miles in. Either way, prepare for water, mud and (depending on how high you go) snow en route to close-up views of Mount Baker, and don’t go near sketchy snowfields unless you know what you’re doing. 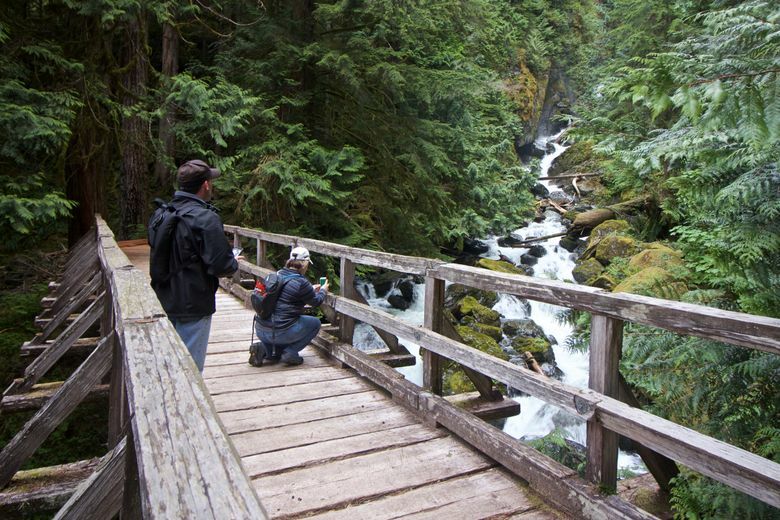 • The Mount Baker-Snoqualmie National Forest website has relatively current information (updated about once a week) on roads and trailheads in the forest, including the Baker River Trail. See bit.ly/2swZhNz. Information is organized based on the main access road you’d take to get to a given area — Mount Baker Highway for areas north and west of Mount Baker; Baker Lake Road for areas to the south and east. You can also call or stop in at ranger stations in Granite Falls and Glacier. Rangers appreciate it if you let them know what you encountered on roads and trails. • Check Washington Trails Association trip reports on wta.org to see how other hikers have recently fared in the area you’re planning to visit. Look for reports of trails with sturdy, intact bridges if you’re not the river-fording type. Throw microspikes and hiking poles into your backpack for hikes that reach higher elevations, and always remember the Ten Essentials. Poles can also help with tricky stream crossings, and waterproof footwear is a good idea. Most trailheads around Mount Baker are on Forest Service land, so a Northwest Forest Pass or interagency pass is required to park at trailheads.